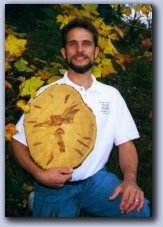 A Personal Testimony of Richard W. Fischer, Jr. Some time ago, I was in the middle of working on the worst construction project of my life. 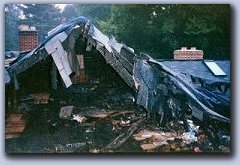 At the time, I was employed as a carpenter by a company that specialized in fire and other insurance restoration work, and the home I was working on during this season of my life had lost most of it's roof to a fire. Until we arrived some four months later to begin the demolition and rebuilding, the home had been exposed to the elements, and had become riddled with mold. The basement especially was black from floor to ceiling! Inside my heart, I felt much like this house. Though I'd accepted Jesus as my Savior many years before this, for various reasons, I had come to a place in my life where I seriously doubted that God even existed, and one Thursday morning on my way to this job site, I prayed a prayer something like, "Lord, unless I see you face to face, I just can't believe anymore." Before moving forward with this story, I need to say that the cause of this particular fire was a lightning strike to a tree next to the house. When it struck, the lightning had arced across to the roof of the house, and had ignited the blazing inferno. Now, here I was, trying to make this pile of charred, moldy, soggy debris into a home again. Not an easy or in anyway pleasant task, but someone had to do it, and in this case, it was me, and the team that God had placed under my lead. Anyway, to get on with my story. That evening after my earlier doubt-filled prayer, as I was leaving to start my drive home, a tree removal company showed up to cut down the now dead remains of the tree. When I arrived at work the following morning, the tree had been reduced to a stack of two foot long logs that covered the bulk of the homeowner's driveway. Immediately, I noticed something very unusual about these logs! Specifically, each one of them was with incredibly brilliant blood red markings. As I worked through the day removing debris from the basement and placing it in the dumpster, one particular log kept catching my eye because the markings looked amazingly like Jesus hanging on the cross!! You would think with this kind of sign from the Lord, I would have immediately fallen on my knees in worship, but instead, I told the Lord, "No, this is a sign, and I said I needed to see you face to face!" Looking back on this, it's amazing that the Lord didn't strike me with lightning and end it all right on the spot, but in His grace, mercy, and understanding, He soon let me know He had other plans for my life, which began to unfold the following Saturday morning. At this time in my life, I was a member of Ohev Yisrael Messianic Jewish Congregation located in Newington, Virginia. For those who may not be aware, a Messianic Jewish Congregation is made up of both Jews and Gentiles who believe that Yeshua (Jesus' name in Hebrew) is the promised Messiah. This particular Sabbath morning, I decided to go to services more out of habit than a desire to spend time with God and His people, yet in the middle of the worship service, God stepped into my life in a very personal and loving way. Though I hadn't told anyone about my prayer that Thursday morning, or about the blood red image of Jesus I'd seen in the log all day on Friday, God knew all these things, and as such, He prompted one of the worshipers to walk to the front to speak with the Pastor. The Pastor then gave him the microphone, and the person very simply said, "The Lord told me to say that He still speaks through signs!." At this, my hard heartedness began to melt away. Though God hadn't chosen to give me what I'd asked for (at least not the way I was viewing it at the time), He'd given me what I needed! He Loved me enough to understand the rest of my life's story, the things that had brought me to the place of turning my back on Him, and He flipped them into an opportunity to testify of His Love, Grace, Mercy, and Forgiveness!! In the years that have followed, through the remainder of my membership at Ohev Yisrael, and even this morning as I'm remembering this story again and sharing it with you, I've learned, and am still learning, that in a manner of speaking, I did see God's face in all of this! I saw it in the face of the man who heard God's voice during the service and was willing to be obedient to share it. I saw it in the face of my now former Pastor, who was discerning enough to know that what was shared with him privately needed to be shared publicly. I also saw it in the faces of the other men and women who were worshipping the Lord that day in music and dance, when I was unable to do so. Certainly, I understand that there is much much more to come, and what I've seen in all of this is no doubt but just one small brief twinkle in the eyes of God's true face. What a glorious day it will be when we meet Him on the other side of the grave in all His Glory and Majesty!! Shalom and Blessings in Messiah Yeshua! © 2006 Richard W. Fischer, Jr. All Rights Reserved. Permission granted to reprint and distribute for non-commercial puposes. All other uses by written permission only.